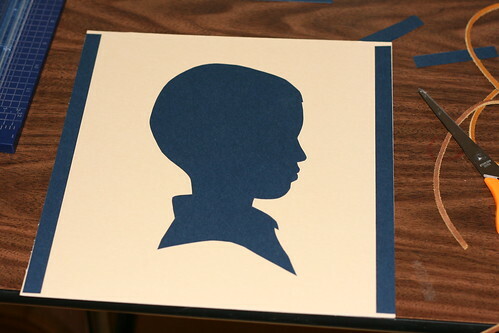 When I posted the silhouettes I made of the children, I had several requests for instructions. Because my brain can only handle small pieces of information at once, I took a simple project and broke the instructions into a 3-part series. Part 1 can be found here. Part 2 is here. 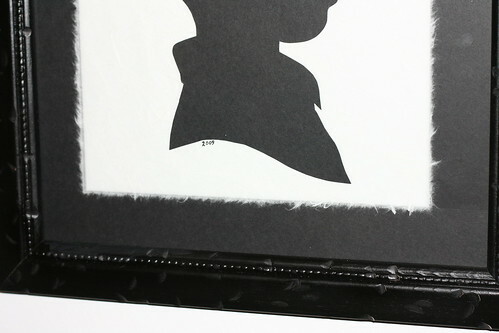 b) I had made the silhouettes fairly large, so I needed 10″ x 13″ frames — 4 of them. c) I didn’t want metal or plastic frames, but real wood frames. I didn’t care if the frame styles matched. I knew I would paint them all black, which would pull the look together anyway. Fortunately, I found 4 matching frames in my favorite consignment shop — the perfect size and all wood. I took apart the frames and painted them black. 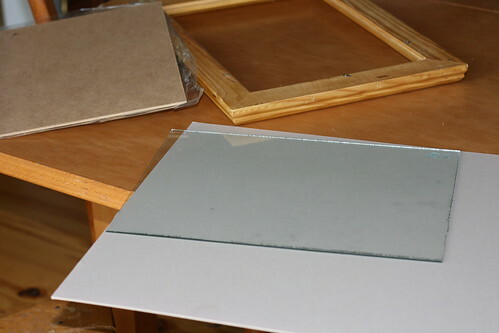 Then I laid the frame glass on a piece of mat board I happened to have. Any piece of cardboard would work. I traced around the glass to get the perfect fit for my frame. This is the part that will make my sister shudder. Instead of using the nice mat-cutting stuff she gave me, I used an ordinary pair of scissors to do this . . . . The scissors do not give a nice, clean cut like the mat-cutting thingy would have, but I didn’t need a clean cut. The lip of my frame hid the jagged edges made by the scissors. I had to use the 4-strip method because my silhouettes were so large. 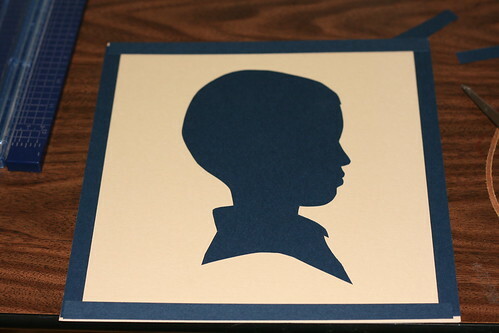 If I had made smaller silhouettes, I could have just cut a rectangle out of one 12″ x12″ piece of scrapbook paper. I added the top and bottom strip. Again, the strips don’t perfectly cover the edges and corners. The lip of the frame hides those imperfections. If you tape down the strips well at the overlap point, the overlap is hardly noticeable. In the above picture, the strips are NOT taped down, so you see the overlap clearly. At this point, you can pop the silhouettes in the frame or embellish them. I chose to add mulberry paper, which is a very thin, fibrous paper. It is also trasparent, which is why I had to use white paper to cover my matboard. 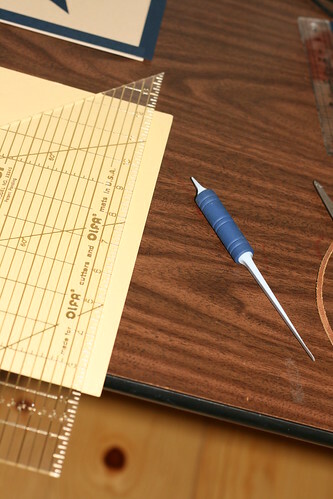 I didn’t have another piece of mulberry paper to show how to cut it for this post. 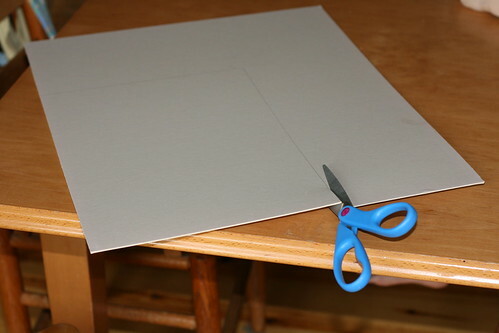 Here, I am just using a regular piece of scrapbook paper to show the general technique. This is just the technique I came up with, by the way. There may be better ways of dealing with this. First, decide where you want to tear the paper. I tore mine so that the ragged edges just barely covered the line where my black strips met the white background. Starting at the top, begin to carefully tear the paper very slowly, progressing maybe a quarter inch at a time, firmly holding the ruler down at the same time. 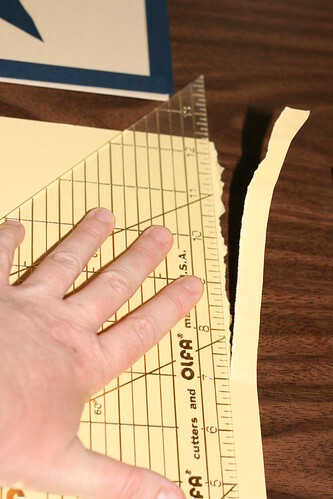 If you hold the fingers of your tearing hand very close to the ruler edge, it will give you more control over the tear. Lay your torn paper down on your mat, lining up the edges to your satisfaction. With a pencil, lightly mark where you need to make the next tear, so you know where to lay your ruler. Repeat the tearing process until all 4 sides of the paper are torn. Carefully place your torn paper and tape down. Then center and tape down your silhouette and pop it in the frame. I like the torn edge look. It adds a little interest and detail without detracting from the simplistic beauty of the silhouettes. I probably would have been just as happy with the torn edges of regular paper as the mulberry paper. But I had always wanted an excuse to try using the mulberry paper. 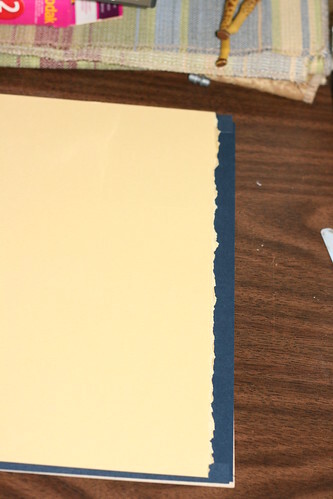 Here is another look at the mulberry paper. The torn edges have a more feathery look than the regular paper. Again, a very minor detail and I really like the rough, torn edges of regular paper too. I also chose to write in the year 2009 at the bottom of the silhouette. It is not a detail you notice when standing back, but only when you step in to take a closer look. ***One note on working with mulberry paper. In a few places, the “fibers” were thicker and tougher, which made tearing at that spot a little more hazardous. I kept my tiny scissors handy while tearing. When I came to a spot that resisting tearing easily because of a tough fiber, I “snipped” through that fiber and then continued tearing. I am pretty sure that if I had “forced” it, I would have lost control of the tear. Whew! This was a long post. I hope all my silhouette blather is helpful to someone. I would love to know if you make silhouettes. Seeing a picture of your silhouettes would be an added bonus.